The Advent Chorale of Western New York, Inc. (formerly the Community Advent Chorale) began in 1979, out of the dream of the East Aurora Ministerium, to present an annual performance of Handel's greatest Masterwork, Messiah as - A Gift to the Community. The late Carl Druba began as the Chorale's first conductor for the initial two performances and for the next sixteen seasons, was led by Bill Graf; Cheryl Delventhal, and Tim Kennedy each directing two performances after Mr. Graf's tenure. Gregory White was called to the post of Music Director - Conductor in 2001. Under his tutelage and leadership, the Chorale has emerged as a prominent choral ensemble on Western New York's music scene. Its membership is a melting pot of 120 talented singers from the Western New York region who come from all walks of life and represent a variety of occupations, denominations, and ages, and most have joined the Chorale after hearing one of its performances. The Chorale continues to diversify itself and its vision for the future. Its performances now include a professional chamber orchestra, and soloists that have performed internationally, throughout the United States, and across Western New York Region. 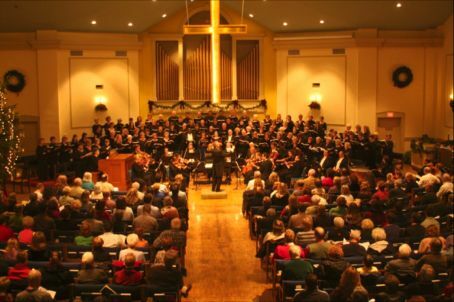 For thirty-nine consecutive seasons, the Chorale has given an annual performance of Handel's Messiah as A Gift to the Community. Due to the growth of its audiences, standing-room only performances, the Chorale presents two performances each season at the Orchard Park Presbyterian Church, Orchard Park, NY and Baker Memorial United Methodist Church, East Aurora, NY, during the first weekend in December. The enthusiasm of our audiences and the Western New York community speak accolades of the Chorale's powerful and dynamic performances of Messiah. In 2010, the Chorale was selected as the first in a series of concert performances across the United State of America in celebration of the 25th Anniversary of Early Music America - an organization of artists and ensembles dedicated to the performance of early music. Advent Chorale of WNY concert performances are made possible through the enthusiastic support of our audiences, and the generosity of our community patrons, supporters, and benefactors. We are grateful for their on-going and continued support each season, support that makes a Gift to the Community possible. The Community Advent Chorale is governed by a Board of Directors who provides the ongoing vision and leadership of the Chorale.